Please note: This is a stock vehicle and therefore colours are limited. Please enquire for details. 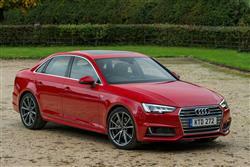 Find out everything you need to know on the new Audi A4 from independent vehicle review website Car And Driving. You can watch the video review to the left to see more of the car or read their written review below to get a true insight from an expert in the automotive industry. Audi's A4 needed to up its game in the face of tough competition from BMW's 3 Series, Mercedes' C-Class and the Jaguar XE in the image-conscious compact executive sector. It has. The styling of this fifth generation model may be evolutionary but underneath are serious revisions that will challenge rivals harder than ever. Car & Driving's experts take a look. This fifth generation Audi A4 is very much a thorough evolution of its predecessor and now claims to be class-leading in nearly all the areas that really matter to business buyers in the compact executive segment. That means efficiency, cabin quality, practicality and technology. As a result, it'll be hard to ignore if you're looking for a car of this kind. Audi knows a thing or two about mid-sized family cars with a prestigious feel, compact executive contenders like this A4. This model, along with BMW's 3 Series, has driven huge growth in that compact executive segment, vanquishing Mercedes' C-Class in the process. Today though, things are different. The C-Class has been rejuvenated into a much stronger proposition, the 3 Series range has been usefully improved and a very accomplished new class rival has arrived in the form of Jaguar's XE. This MK5 model A4 is Audi's response. If you think it doesn't seem that much different, then look a little closer. What we have here is a car that's lighter, sleeker and cleverer than before. As a result, this Audi is inevitably more efficient too, with a tax-beating sub-100g/km of CO2 figure now promised on the most frugal diesel models. Inside, we're promised the classiest cabin in the segment - and one of the most technologically advanced. Plus, as usual, there's the option of quattro 4WD and either saloon or Avant estate bodystyles. The A4 has always struck an appealing balance between handling and comfort and with this MK5 model, the Ingolstadt engineers have sought to improve its credentials still further by developing a new five-link suspension system. Optional adjustable shock absorbers with 'sports' and 'comfort' modes will enable owners to get the most from this and a dynamic steering system is another extra cost feature that'll reward those you like their driving. Both features can be controlled through the standard Audi drive select driving-dynamics system, which alters throttle response and auto gearshift timings in its most basic form. Talking of auto gearshifts, the old CVT automatic gearbox has gone, replaced by a seven speed dual clutch 'S tronic' unit that claims to be able to improve both performance and fuel consumption. As before, the A4 differs from its BMW 3 Series rival in its use of front wheel drive for most models. Also as before though, quattro 4WD is optional - and standard on the top V6 variants. The most powerful of these models even has the option of a sports differential for the rear axle to maximise traction. Refreshingly in a segment dominated by cars fueling themselves from the black pump, TFSI petrol models are still very much part of the mainstream A4 range, a 150PS 1.4-litre unit offered alongside a pokey 2.0-litre powerplant offering either 190PS or 252PS. There's also a 354PS 3.0-litre TFSI sporting S4 model at the top of the range. Most A4 buyers though, will continue to want a diesel, probably the 2.0 TDI 150PS variant, which gets to 62mph from rest in a brisk 8.6s. If you want more diesel power, then a 190PS version of this unit is also available, plus there's a 218PS 3.0 TDI V6 model further up the range. This time round, the A4 is lighter - significantly so in fact. A hi-tech 'MLB' platform uses high strength steel and aluminium to reduce weight by up to 120kg compared to the old model, despite this MK5 design growing in all areas except height. As for styling, well saloon and Avant estate versions of this fifth generation model offers a clear evolution on what went before, with all features sharpened and defined. Special attention has been paid to aerodynamics, this A4 boasting the lowest drag coefficient in its class. As usual, there's a choice of either saloon or Avant estate bodystyles, the latter offering 505-litre boot - or 1,510-litres with the rear seats folded. The interior is typically Audi and a very classy place to be. Everything is well laid out with high grade materials in all areas you'll interact with regularly. There's the option of getting an 8.3" touchscreen mounted on top of the dashboard but even if you stick with the standard centre dash infotainment screen, you'll get an up-to-the-minute set-up able to support the latest Apple CarPlay and Android Auto connectivity. Overall, you wouldn't call the appearance of this A4's cabin exciting but it would certainly be a soothing environment for long journeys. It's surely clever, a key option being the neat 'Audi virtual cockpit' we first saw on the TT sportscar. This replaces all the dials in front of the driver with a 12.3" high resolution LCD screen. As for practicality, well there's more luggage space this time round, the Avant estate variant now offering a class-leading 505-litre boot, extendable to 1,510-litres if you wish. Prices have inevitably risen slightly, but still occupy much the same bracket as before, so expect to be paying somewhere between £26,000 and £38,000 for most models, with a premium of £1,400 for the Avant estate bodystyle. There's a choice of three transmission options, a six-speed manual gearbox, plus two auto set-ups, a seven-speed dual-clutch S tronic and an older-tech eight-speed tiptronic. At least standard equipment is pretty complete across the line-up. All trim levels include alloy wheels of at least 17-inches in size, Xenon headlights with LED daytime running lights, the 'Audi smartphone' interface, the 'Audi drive select' driving dynamics system, three-zone climate control and a 7-inch colour MMI infotainment monitor. We'd want to look at a couple of key options. The 'Audi phone box' connects smartphones to the on-board antenna and charges them. Meanwhile, for discerning hi-fi fans, a Bang & Olufsen 3D Sound System with innovative 3D sound is available. As for safety, well along with the usual airbags and electronic safety nets such as ABS and stability control, there's optional active lane assist, a rear cross traffic alert, collision avoidance assist plus a cruise control system that assists with tiresome traffic-jams. Running costs are of course a vital consideration in this segment and this A4 offers some impressive numbers thanks to this generation model's weight reductions and that sleeker shape. The volume 2.0 TDI 150PS ultra diesel variant delivers best-in-class readings of 74.3mpg on the combined cycle and CO2 emissions of 99g/km. Opt for the pokier 2.0 TDI 190PS variant and the figures become 72.4mpg and 102g/km, so there's no huge penalty for the extra performance. The particularly cultured V6 TDI engines also show impressive restraint. The 218PS version with seven-speed S tronic transmission registers a 109g/km output when combined with Sport specification and front-wheel-drive. Also deserving of a special mention is the 2.0 TFSI petrol engine with 190PS. It slashes CO2 output to as little as 116g/km through the use of a completely new combustion process developed using the familiar Miller cycle as its basis, and will be notable for its ability to deliver optimal response across the entire engine speed range. All A4s come with a three year 60,000 mile warranty which can be extended to four years/75,000 miles or five years/90,000 miles for a fee. Audi residuals are some of the best in the business, assuming you pick a desirable engine and trim combination. Some restraint on the all too tempting options list will help too. Audi has spent nearly a quarter of a century perfecting its A4 - and that really shows in this fifth generation model. It's a spacious, classy car that's very composed to drive and is fully conversant with the kind of hi-tech design and faultless cabin quality that its target junior executive market likes to expect. So it stacks up in the showroom just as well as it does on the balance sheet, with running cost returns that with most engines will make it your company accountant's go-to choice. Even more than before, this A4 feels like a car that's been lovingly and very carefully considered. The depth of engineering and the thought that's gone into the tiniest details combine to further enhance the warm fuzzy feeling that's charmed Audi customers for years. If you're one of those people, then you'll like this car very much. And even if you're not, you'll find it hard not to be impressed by way it systematically ticks almost every box on the compact executive market wish list. It's very thorough. And very Audi.